There were two reasons as to y I picked this book. First being heard gud things abt it, got my curiosity. The other reason, when the movie hit the theaters and that lead to my attention. I chose book over movie, cuz for me book is any day better. I can't give my 3 hrs to movie but can happily give 6 hours to book. 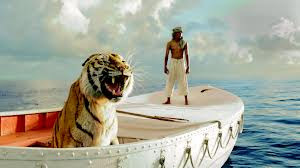 Pi Patel (Piscine Molitor Patel), age 16, Indian boy who is from Pondicherry, India and is a son of zookeeper, is the only sole survivor of the cargo ship and returns to the land after 227 days. 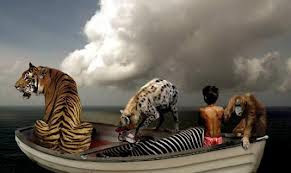 He spent 227 days in the sea and he shares his boat with Zebra, Orangutan, Hyena and an adult Royal Bengal Tiger. By the end of the novel he provides two different explanations for how things went and what happened. The first quarter of the book is about his spirituality. His spiritual growth. He is Hindu but how he discovers and adopts Christianity and Islam. The next part was about his childhood in Pondicherry. That moved very slow and I just became more n more impatient to move forward. His childhood experiences were entertaining and a little humorous but again a little too draggy and nor did i find writing too compelling as well. As the story takes it's course through his childhood, there comes a time when his father announces that they r going to sell their zoo and move to Canada. 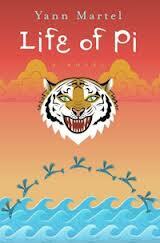 I was convinced that the Life of Pi is going to change. From here the novel is very different. Pi and hid family and all their zoo animals embark on a Japanese freighter bound to Canada, but ship never makes it. The only animal left are Zebra, Orangutan, Hyena an the tiger and of course Pi. One by one all the remaining animals meet their demise until only Pi and tiger are left. Its a novel of suffering, spirituality and survival. I recommend this book for the lover of adventure stories. Trust me, m not one of them but, I loved this one. Just enjoy this book with active and open imagination by not going deep into religious aspect of the story.